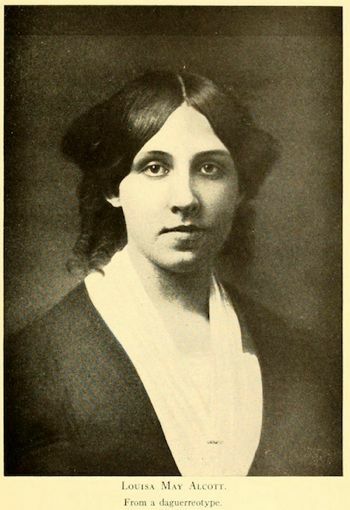 On November 29, 1832, Louisa May Alcott (1832-1888) was born the second daughter of Amos Bronson Alcott and Abigail "Abba" May in Germantown, Pennsylvania. Her father, Bronson Alcott was a teacher that believed children should enjoy learning, a controversial notion for the time and he moved the family to Boston, Massachusetts in 1844 where he established the Temple School and joined the Transcendental Club with Ralph Waldo Emerson and Henry David Thoreau. Alcott's upbringing was greatly influenced by the Transcendentalist Movement, which strongly impacted her writing. Setbacks at the school forced the family to move several times, and in 1843-1844 they lived for a brief time at the experimental utopian Fruitlands community. After the failure of that community they ended up in rented rooms and ultimately in a house in Concord that they purchased with the help of Emerson. She seems to have enjoyed her time in Concord and reportedly acted out plays that she had written with her sisters. Her primary educational instruction was received from her father, but she also received some instruction from family friends including Emerson, Nathaniel Hawthorne, Thoreau and Margaret Fuller. While in Concord, the family harbored a fugitive slave as part of the underground railroad for a week during 1847. That same year, Louisa read and admired the Declaration of Sentiments published at the Seneca Falls Convention on Women's Rights, and she was the first woman to register to vote in Concord, Massachusetts. The family returned Boston in 1849 when her father was unable to find a steady income in Concord. Louisa began to take the odd jobs that she could find in order to contribute to the family's finances. With her older sister Anna she taught small children, mended clothes and washed laundry. In 1852 she published "Sunlight," her first poem under the pseudonym Flora Fairfield. In 1854 she published her first book, Flower Fables, originally written for Ralph Waldo Emerson's daughter Ellen. The beginning of a career that would end her financial worries and bring her great fame. The family moved to Walpole, New Hampshire, while Louisa stayed in Boston to continue her fledgling literary career. But in 1856 her younger sister Lizzie contracted scarlet fever and ultimately passed away on March 14th in Concord, at Orchard House, the home that Emerson had purchased for the family. After the marriage of her older sister Anna, Louisa returned to Concord in 1857 to comfort her mother and help ease the loneliness she felt from the absence of two of her daughters. It was a bad year for Louisa, unable to find work and filled with despair, and then she read Elizabeth Gaskell's biography of Charlotte Bronte, and found parallels to her own life, which perhaps encouraged her. In 1862 Louisa headed to Washington, DC to serve as a Civil War nurse. During this time she contracted Typhoid fever and was treated with calomel, a mercury-laden drug used to treat the disease at the time. As a consequence, she suffered the effects of mercury poisoning for the remainder of her life. Her experiences as a nurse inspired her to write Hospital Sketches (1863). In 1864 she followed it with Moods. At this point in time, her publisher requested a "girl's story" and in two and a half months Alcott produced Little Women, a book that was largely based on her own experiences growing up with her tree sisters. Little Women, her most beloved work, was an instant success and the public demanded a second volume. The financial woes that had troubled the Alcott family were finally over as Little Women launched the author as a literary star. Louisa May Alcott, author, b. in Germantown, Pa., 29 Nov., 1832; d. in Boston, Mass., 6 March, 1888. When she was about two years of age her parents removed to Boston, and in her eighth year to Concord, Mass. At the age of eleven she was brought under the influence of the community that endeavored to establish itself near Harvard, in Worcester co. Henry David Thoreau was for a time her teacher; but she was instructed mainly by her father. She began to write for publication at the age of sixteen, but with no marked success for fifteen years. During that time she devoted ten years to teaching. In 1862 she went to Washington as a volunteer nurse, and for many months labored in the military hospitals. At this time she wrote to her mother and sisters letters containing sketches of hospital life and experience, which on her return were revised and published in book form (Boston, 1863), and attracted much attention. In 1866 she went to Europe to recuperate her health, which had been seriously impaired by her hospital work, and on her return in 1867 she wrote “Little Women,” which was published the following year, and made her famous. The sales in less than three years amounted to 87,000 copies. Her characters were drawn from life, and are full of the buoyant, free, hopeful New England spirit which marked her own enthusiastic love for nature, freedom, and life. Her other stories were conceived in the same vein, and have been almost equally popular. They are: “Flower Fables or Fairy Tales” (Boston, 1855); “Hospital Sketches,” her first book, now out of print, reissued with other stories (1869); “An Old-Fashioned Girl” (1869); “Little Men” (1871); a series called “Aunt Jo's Scrap Bag” (1871-'82), containing “My Boys,” “Shawl Straps,” “Cupid and Chow-Chow”, “My Girls,” “Jimmy's Cruise in the Pinafore,” and “An Old-Fashioned Thanksgiving”; “Work, A Story of Experience” (1873); “Eight Cousins” (1874); “Rose in Bloom” (1876); “Silver Pitchers” (1876); “Under the Lilacs” (1878); “Jack and Jill” (1880); “Moods” (1864), reissued in a revised edition (1881); “Proverb Stories” (1882); “Spinning-Wheel Stories” (1884); “Lulu's Library,” the first of a new series (1885). Ednah D. Cheney wrote her life (Boston, 1889). — Another daughter, May, artist (Mrs. Ernest Nieriker), b. in Concord, Mass., in 1840; d. in December, 1879. At the school of design in Boston, and in the studios of Krug, Rimmer, Hunt, Vautier, Johnston, and Müller she received the best attainable instruction, and subsequently divided her time between Boston, London, and Paris. After her marriage she lived mainly in Paris. Her strength was as a copyist and as a painter of still life, either in oils or water-colors. Her success as a copyist of Turner was such as to command the praise of Mr. Ruskin, and secure the adoption of some of her work for the pupils to copy at the South Kensington schools in London. In these branches of work she had few equals. She published “Concord Sketches,” with a preface by her sister (Boston, 1869). Visit American Literature's American History in Literature, Civil War Stories, Transcendentalism - Study Guide, and our African American Library for other important writings and figures which helped shape America. 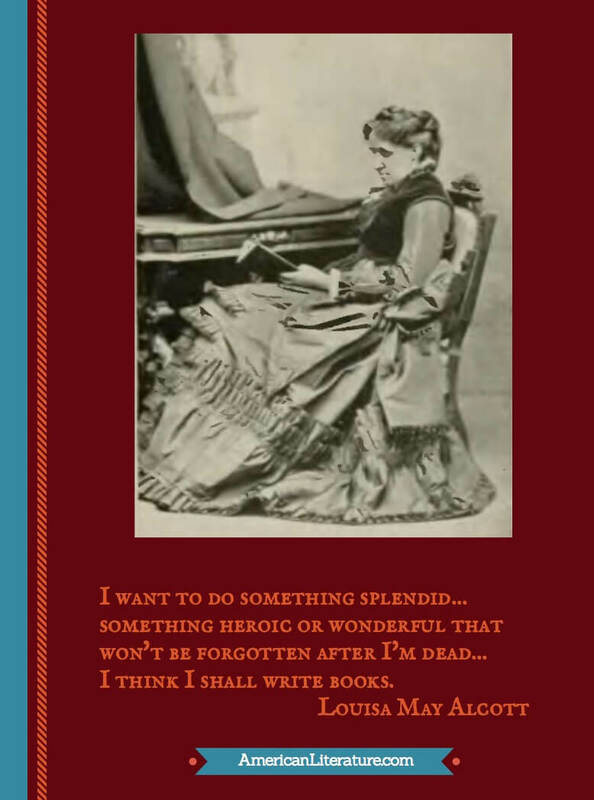 Enjoy American Literature's Feminist Lit: Louisa May Alcott & Kate Chopin images on Pinterest.